It’s that time of year. All the stores are shouting: BACK TO SCHOOL. But for many of us, it’s “school as usual.” Not anymore! Time for some fanfare! Now in its sixth year, welcome to the “Not” Back to School Blog Hop. Anyone can link up with this blog hop and the more the merrier! Learn what others are using. Share your plans. See what works, or what doesn’t, for others. Share your photos. It’s a Not-Back-to-School blog hop for homeschoolers, afterschoolers, preschoolers, carschoolers, anyone – anyone at all – who teaches at home and wants to share or needs a little encouragement. Meet new bloggers, get to know homeschoolers near you and nowhere near you. First week in August: It’s a curriculum hop. Share your well-researched plans on your post. Show us what you love. Four math curriculums later… you decided on?? Second week in August: It’s a school room hop. Tell us about your “school room”. This can be a dedicated space, or what you’ve made work. Post photos, storage ideas, comfy chairs. Your garage? Or dining room table? An actual school house? Show us where you school! Third week in August: It’s a “not back to school photo” hop. This time, share your students! All too often, homeschoolers forget to take that token not-back-to-school photo. So, you can wear a backpack and new shoes like the typical first-day-of-school photos, or you can wear a batman costume, goggles and barefeet – like my homeschoolers. Come as you are. First-day-of school photos shared. Fourth week in August: Day in the life. Do you rise at dawn, say the pledge of allegiance, sit at desks, have recess? Do you school year round or do nature hikes? Or do you start well-caffeinated and hide in the bathroom for your own recess? Tell us about a typical (or not so typical) day in the life of your homeschool. Here is your chance to show off your planning, or make yourself accountable or simply just show your student’s or students’ smiling faces. 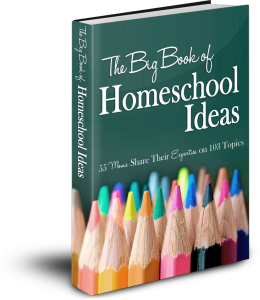 Can’t wait to see a glimpse into what makes homeschool successful for you all.